Genre: LGBT, Romance and Relationships, Political, Contemporary Fiction, Thriller. Early morning, Riyadh, Saudi Arabia: Swedish correspondent cameraman Ebbe Skoog is out getting shots for an upcoming story and stumbles upon something he isn't supposed to see. On a building site, on the outskirts of the city, four men looking a lot like the Mabahith - the secret police - are sending a bound man to a certain death by stoning. With camera still rolling, Ebbe begins to retreat when a second man enters the scene and throws himself on top of the dying man, shielding him with his body, soothing with loving words. Ebbe's reaction is immediate. Clutching his camera, he drags the screaming lover out of the rain of stones and in a storm of sand, they flee into the brutal uncertainty of the desert. Correspondent reporter Mattis Andersson is the wild card, the rebel. He's also Ebbe's only hope of getting out alive with his new companion, Aasim El-Batal, and the memory card holding the footage that will make Saudia Arabia burn in the eyes of human rights activists the world over. With their past as lovers, and their present as colleagues and best friends who would take a bullet for each other, it now falls on Mattis to protect his and Ebbe's future. But the Swedish government wants to silence them, unwilling to jeopardize years of lucrative weapons deals for "some petty gay love affair." It's an impossible mission that will draw on every strength the two men possess. I love my job. Like any job, there are times when it can be a bit of a battle of endurance. Looming deadlines, sticking to schedules and having to work when I'm sick because there's no-one to pick up the slack can take their toll. But since I started Beaten Track Publishing, I wake up looking forward to what every single day has in store. In a way, it's like having a library of my favourite books at my fingertips with a permanent excuse of 'I need to read this...for work'. I publish the books I want to read/would have wanted to read when I was younger, and refusing to bend to the sway of the market gives Beaten Track immense freedom. It's risky; there are books in our catalogue which sell very few copies and don't financially compensate for the time taken to get them 'out there'. But all of our books are important in some way or other. Many have tremendous cultural/social/political importance. They're not always the books I would choose to read for pleasure because, being a bit of an escapist wimp and all. In my personal reading, I generally steer clear of horror and thrillers, largely because they tend to be driven more by plot than character, and I'm a natural psychologist. There is nothing I love more than everyday explorations of the human psyche. It takes a very skilled author to write a story that is strong on both plot and character development. Silent Terrorism is the latest of Phetra H. Novak's novels and showcases her incredible ability in this regard. It's a tough read, dealing with the uglier aspects of human existence, specifically: how the political elite turn a blind eye against atrocities committed by other members of the elite if it's in their interests to do so. 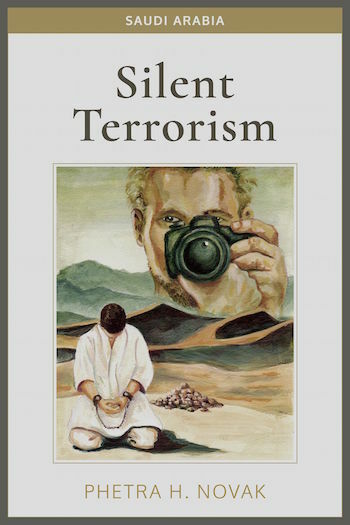 Silent Terrorism is the story of a few brave men fighting for justice, fighting for their lives, and through the events that unfold, we follow their distinct yet intertwined journeys towards the same goal. There are very few female characters, but as most of the novel takes place in Saudi Arabia, this is to be expected. The women we do meet hold powerful positions in Western society, and their portrayal is too complex (and would spoil too much of the plot) to explore in this review. All of the characters are flawed, some more so than others, in some cases irredeemibly. At the heart of it all, is Ebbe Skoog, our 'hero' in the truest sense of the word, whose every action is underpinned by an extraordinary (and dangerous) belief in justice. I can't say I enjoyed his journey, but I admired his strength and determination, and I never once stopped rooting for him. As for his partner Mattis...well, he certainly doesn't have Ebbe's quiet fortitude, but I appreciated his brash, say-it-like-it-is approach. It's vital to the rescue mission, as well as delivering brief moments of humorous respite, like flares of colour and hope in the desolate desert landscape of this novel. Politically, Silent Terrorism tackles the complexities of international relations between cultures that share little common ground, even outside of the big human rights debates. Yet there is no dichotomy of West vs East, Good vs Evil. Instead, we encounter a detailed exploration of these issues through the events that unfold and the responses of the agencies involved in trying to get Ebbe and Aasim out of Saudi Arabia. All in all, this is not a 'nice' read, but it's a damned good one - thought-provoking, emotional, devastating in places, but trust the author. Phetra ensures us safe passage to the other side. 50% of the proceeds of this book goes to Colin Stewart and Erasing 76 Crimes. Silent Terrorism is a political thriller by Phetra H. Novak, and is available in paperback and ebook formats from Beaten Track Publishing and all the usual places. Phetra often refers to herself as the odd man out, the dorky book nerd. She'd rather spend time with a good book or making up fantastic stories with even more fantastic characters, than live in the real world, dealing with real people. The real world is strange, in a very non-humorous way, and people in it complicate it to the point of wearing you out. In the written word world, whether it's someone else's words or her own, things might get busy, complicated, and even downright painful, but somewhere along the line, a hero's always on the horizon. He's probably not a prim and proper, church-going pretty-boy since the author prefers rebellious men and women who don't follow the protocols of society. One of her favorite sayings is that 'Only dead fish follow the stream,' and well she ain't no dead fish. 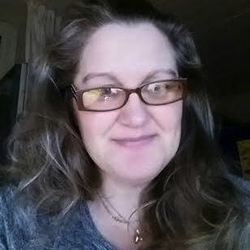 Phetra lives with her family - two children, a domestic partner, and their two cats in Gothenburg, Sweden. When reading her books, you'll notice she always finds a way to bring her own culture into her stories. The joy of reading and writing comes from her childhood and is something she has always loved, and been passionate to share with others. Phetra loves hearing from her readers, even with ideas of what they'd like to come next. If you are looking for her, the best place to start looking is at home in the quietest corner of the house, where she'll be curled up with either her Kindle, reading or with her laptop typing away.